There’s one mildly promising idea underpinning Rings, the latest much-belated Hollywood sequel no one asked for. Everyone who has seen Gore Verbinski’s 2002 The Ring—itself a remake of Hideo Nakata’s 1998 J-horror classic Ringu—knows what the deadly video that kills all its viewers seven days after watching it looks like, and whose consciousness it represents. As implied by the plural title, though, there is a second video involved, one that suddenly appears in the middle of that first one after the protagonist, Julia (Matilda Lutz), watches it. The more we learn about these new images, the more interesting (if only marginally so) they become, especially when Julia begins to connect them to the past of Samara (Bonnie Morgan), the girl who climbs out of the first video in order to kill her victims. Without spoiling too much, this “movie within a movie” basically develops into something of a family drama glimpsed through the confines of these macabre images from the unconscious, with Julia acting as a kind of empath go-between. That would be a tantalizing idea for any movie. It’s a shame, though, that it had to be saddled to a movie as incoherent, illogical and plain dull as Rings. You know things are bad when not even an opening set piece on a plane—a scenario any hack could easily exploit to stoke viewers’ primal fears—barely inspires a shriek, much less a chill. And as far as pure visceral affect goes, things don’t get much better from there. Even Nakata, who made a sequel to Verbinski’s remake of his film, managed to infuse his otherwise misbegotten The Ring Two (2005) with a sense of persistent dread—which almost completely eludes director F. Javier Gutiérrez in this third installment. Maybe even Verbinski and Nakata, with their fearsomely unnerving technique, might have had trouble papering over the deficiencies of David Loucka, Jacob Estes and Akiva Goldsman’s script. Chief among many questions the movie’s bound to inspire in a viewer: Why is it that the personality-free Julia is the one who suddenly sees this new footage, with accompanying visions, and no one else? Does it have something to do with the fact that, unlike many others who have forced someone else to watch Samara’s video just to save their own lives, Julia watches it to save the life of her boyfriend, Holt (Alex Roe)? (If so, that only makes the final twist ending even sillier, not to mention deeply cynical.) And by the way, what is up with the upside-down rainfall Gabriel (Johnny Galecki, bringing way more conviction to his role than this material deserves)—the biology teacher who initiates the science experiment that eventually leads Julia to become the latest victim of Samara’s media-based terror rampage— sees upon experiencing the killer videotape for the first time? Maybe Gutiérrez thought it was just a cool visual, bro. In such a nonsensical context, one may be surprised to come upon a reference in an opening scene in the film to the Greek mythological tale of Orpheus traveling to Hades to rescue his great love Eurydice. To some degree, the tale acts as a metaphor for Julia’s own journey: Led by the visions inspired by the new video footage, she goes through a hell of her own in order to rescue someone from a certain kind of death. 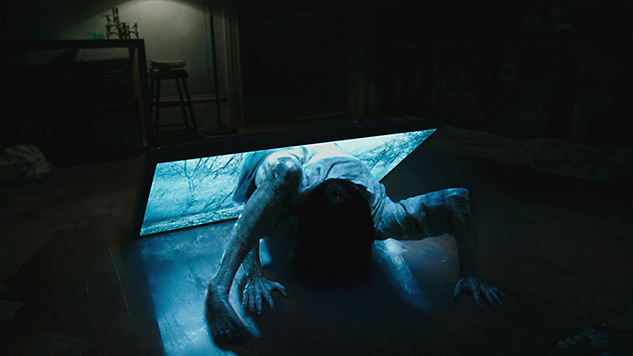 But like most things in Rings, it’s merely a half-baked stab at high-mindedness, thrown in to gussy up what is ultimately just another desperate cash grab at a franchise property that probably should never have been a franchise in the first place. Kenji Fujishima is a freelance film critic, contributing to Slant Magazine, Brooklyn Magazine, The Playlist and The Village Voice. He is also Deputy Editor of Movie Mezzanine. When he’s not watching movies and writing and editing film criticism, he’s trying to absorb as much music, art, and literature as possible. He has not infrequently been called a “culture vulture” for that reason.